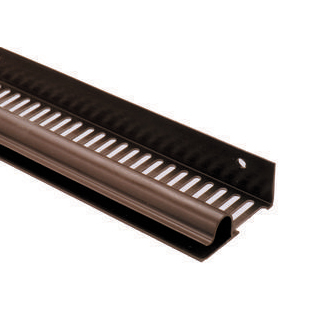 The Corovent Continuous Soffit Vent is designed to provide a solution to roof ventilation where a traditional soffit board is specified. Airflow is guaranteed through a series of evenly spaced slots, narrow enough to keep out large insects but large enough to prevent the vent from becoming blocked. Start by measuring the continuous soffit vent, so that you know the exact distance that you need to fit into your eaves. Take these measurements, and then measure your soffit joist to ensure that you can safety fit the vent into them. Once this has been done, line up your continuous soffit vent against the joist. Using a piece of chalk, mark out the outline of the vent. Take down the vent, and put it in a safe place. You should then proceed to cut out the soffit with either a hacksaw or a power tool. The power tool, such as a circular saw, will give you greater speed and strength when cutting the soffit, but the hacksaw can give you precision, meaning less errors. You should cut a slightly smaller area than the continuous soffit vent needs, and then remove the rest of the area by knife, trimming it when you come to fit the vent. Place the outside edge of the vent into position, and use the drill to drive screws around a foot apart all the way along the vent. You should then go into your attic, and remove the insulation surrounding the new vent hole. Place one or two pieces of lumber between your attic rafters, in order to prevent the insulation from touching the vent, and then make a clear path for the air between the rafters. If you need to make another hole for a different vent, you should place this close to the soffit vent. Inside the attic, add the inside part of the vent to the soffit, placing it around the rafters so that it is held securely in place. If there are studs nearby, screw the soffit vent close to this for that you have additional security. You should then go around the edge of the vent, making sure that it is thoroughly caulked. On the outside, you can either use waterproof caulking or add roof tar to the edges. This will ensure that your continuous soffit vent is secure and watertight, so you can draw in air without making the attic floor damp.